It was a gale-force wind that struck Hopleaf this past Tuesday night. At least, that's what I gather from the way audience members kept telling us they were blown away. We never know quite how any given evening is going to go, but we're happy to report that this latest Tuesday Funk maintained the high quality we've come to expect over the past year. At least in this co-host's humble opinion. If you weren't there, let us tell you a little about what you missed. Things started strong right out of the gate as Emile Ferris blew us away with a fierce primal scream of a poem. John Klima maintained the buzz as he led us on a trippy journey through three related dreams. And to round out the first half of the show, Hanna Martine raised temperatures with a teaser from her extraordinary paranormal erotica. After a break for beer and a poem about Bill's trench coat came a high school reunion of sorts. After a powerful excerpt from Patricia Ann McNair's acclaimed new story collection, her former classmate Jody Lynn Nye led us on a funny and thrilling romp through the dark terrain of lycanthropy. The fact that Patty and Jody go back so far was a synchronicity we didn't discover until after we'd scheduled them on the same bill, which is only one of the many great synchronicities that emerge from any given evening at Tuesday Funk. But don't worry if you weren't there! We'll be posting video of everyone's performances over the coming days and weeks, so watch this space. 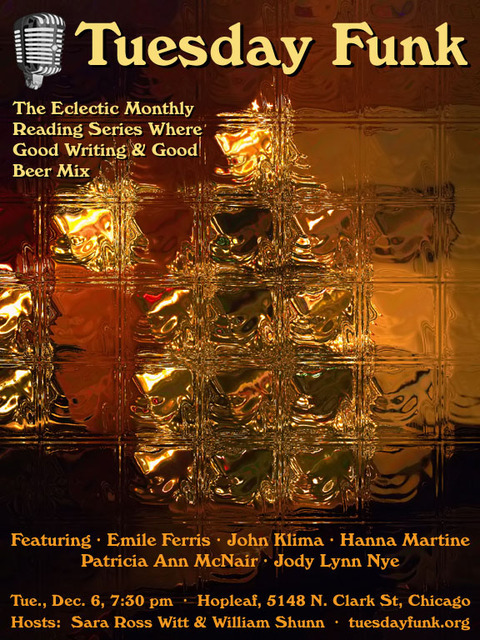 And of course Tuesday Funk will continue bringing great readers together throughout 2012, starting January 3rd with strong work from Stephen Markley, Lawrence Santoro, Christopher Sweet, and more, plus another probable Poem By Bill. Mark your calendar now, because the new year won't properly begin until you've been Funk'd. ...and then be sure to join us tonight at 7:30 pm upstairs at Hopleaf to hear her read, along with our other guests Jody Lynn Nye, Hanna Martine, John Klima, and Emile Ferris. It's free! Reminder: Tuesday Funk #40 is tonight! In honor of the occasion, we'll have five terrific readers for you tonight, though we promised not to reveal which side of the over/under 40 divide they inhabit. And there's beer toomore varieties than we can count (owing to our advanced age). Please join us! Our esteemed lineup tonight includes Jody Lynn Nye, Patricia Ann McNair, Hanna Martine, John Klima, and Emile Ferris. Plus, we'll throw in one of our patented Poems By Bill just for shits and giggles. So "like" us today on Facebook, arrive early, grab a beer from the bar, and get set for a evening of entertainment that will make you feel young again. Um, unless you're already young, in which case it will just make you feel tipsy. Emile Ferris grew up in Chicago and New Mexico. She received a BFA in visual art and an MFA in writing from the School of the Art Institute, where she also received the Toby Devan Lewis Emerging Artist Fellowship in 2010. 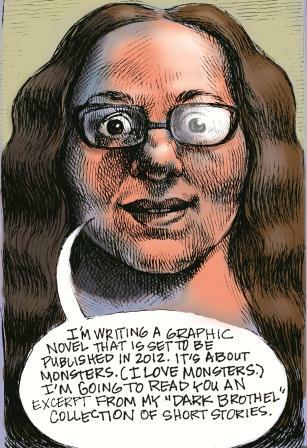 Join us Tuesday, December 6th at 7:30 p.m. to hear Emile read an excerpt from her graphic novel "Dark Brothel" at Hopleaf's upstairs bar! Patricia Ann McNair has lived 98 percent of her life in the Midwest. She's managed a gas station, sold pots and pans door to door, tended bar and breaded mushrooms, worked on the trading floor of the Chicago Mercantile Exchange and taught aerobics. Today she is an Associate Professor in the Fiction Writing Department of Columbia College Chicago, where she received the Excellence in Teaching Award as well as a nomination for the Carnegie Foundation's US Professor of the Year. 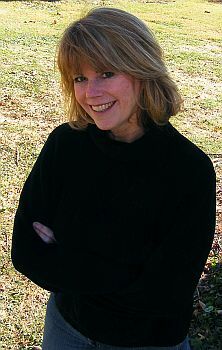 McNair's fiction and creative nonfiction have appeared in various anthologies, magazines, and journals including American Fiction: Best Unpublished Short Stories by Emerging Writers, Other Voices, F Magazine, Superstition Review, Dunes Review, River Teeth, Fourth Genre, Brevity, Creative Nonfiction, and others. She is also published in The Truth of the Matter: Art and Craft in Creative Nonfiction edited by Dinty W. Moore. She's received numerous Illinois Arts Council Awards and Pushcart Prize nominations in fiction and nonfiction. 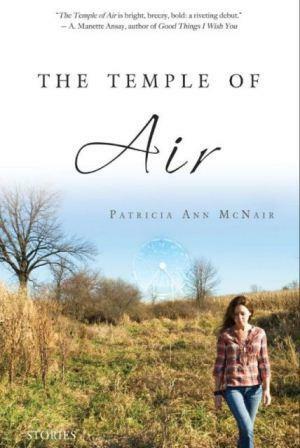 He debut collection, The Temple of Air, was named a "stunning debut" by The Nervous Breakdown. Reviewer Donna Seaman of Booklist writes "McNair's plainspoken yet imaginative, complexly unnerving, and haunting stories raise essential questions of fate and will, appearances and truth, guilt and compassion." This page is an archive of recent entries in the Reading # 40 category. Reading # 39 is the previous category. Reading # 41 is the next category.